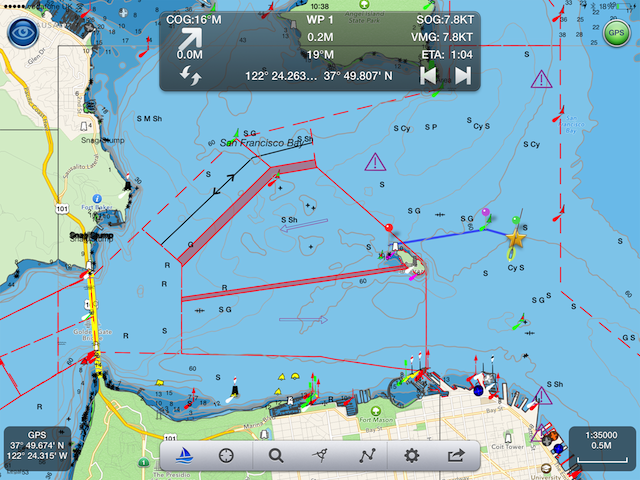 Explore, Plan and Navigate your boating trips in real time and outstanding high-resolution with SeaNav, using the latest Digital Vector Marine charts. SeaNav is available now in the App Store for iPhone, iPad and Mac:- SeaNav US covering the whole of the US Coast and Great Lakes and SeaNav UK covering all of the UK and Ireland and in app options to get additional charts for Canada, France, Netherlands, Belgium and Germany. And if you are lucky enough to have a new Apple Watch, we’ve got you covered too – SeaNav now includes extra functionality that runs exclusively on your Apple Watch! Our SeaNav for Mac apps, SeaNav US for Mac and SeaNav UK for Mac , bring all the power of our mobile app to your laptop or desktop, so you can plan and review trips in comfort – and with syncing between our app’s via your Dropbox account, its never been easier to plan or sail a route. Unique Augmented Reality view with buoys, lights and AIS ships overlaid on the camera view. Route export, import and sharing. Buy once and use on both your iPhone and iPad devices. SeaNav works in high-resolution on your iPad and iPhone without having to buy an additional HD version. Apple Watch functionality is included for free. SeaNav for iOS comes in two versions, SeaNav US which uses NOAA charts and provides complete coverage of USA and Great Lakes. SeaNav UK Charts are derived from material obtained from the UK Hydrographic Office (UKHO) with their permission and offers complete coverage for UK and Ireland. Both versions are available from the App Store on your iPhone or iPad. We also have a new SeaNav free version which comes without any bundled charts – you can use this to see the power of SeaNav’s tools and view our in-app demo, before buying charts for your area from directly inside the app. Charts are available for US, Canada, UK & Ireland, Germany, France, Belgium and Netherlands. SeaNav uses the latest Digital Vector charts providing a wealth of benefits and advantages over traditional raster charts. Buoys, Lights, Bridges, Depth Contours, Depth Soundings, Rocks, Anchorage areas, NOAA Weather Buoys etc. are all selectable and have real time distance, bearing and detail information. Turn off layers to de-clutter the display and only show what is important at the time. Tides, moon and sun times and weather are also all available at your fingertips. Use SeaNav to plan and sail routes. In-app tools let you measure distances and bearings and record waypoints on routes to sail. When you are out at sea, the app’s Sailing HUD shows your position on the route, Course over ground (COG), Speed over ground (SOG), Vector Made Good (VMG), Estimated Time of Arrival (ETA), Distance and bearing to next Waypoint. An audible alarm sounds as you reach a waypoint and routing automatically moves onto the next waypoint. Our unique AR view mode allows you to view buoys, lights, ships, waypoints and track overlaid on your iPhone or iPad live camera view. With “AR LockOn” you can select a target on the chart and then be guided to it in the AR camera view. As you use SeaNav it will automatically download and store the charts for the area you are viewing. The level of detail on the charts changes as you zoom in and out. Tapping an object – buoys, lights, bridges, ships etc. – shows detailed information about them. A long press reveals a crosshair and a popup with depths, links to information about tides, moon and sun times and weather for the area plus links to any objects that are near the crosshair. Tapping again leaves the crosshair showing so you can drag the map to get a particular point under the crosshair and tap again to get information about it. Apple Watch. SeaNav includes new screens and functionality that runs exclusively on an Apple Watch. Used in conjunction with SeaNav on an iPhone or iPad, SeaNav on Apple Watch will guide you to your next waypoint, with cross-track error, ETA and and distance. Other screens show AIS targets, a compass and handy flashlight with night-mode. Pebble Smartwatch. SeaNav hooks up with the Pebble Smartwatch to provide live navigation data on your wrist wherever you are on your boat. Check Speed, Course, Waypoint, Wind, AIS radar, SailSteer and times and get Collision(CPA), Waypoint and Countdown timer alarms. The SeaNav Pebble Smartwatch app is free. Read more in the SeaNav Pebble user guide. GoFree. Lowrance, Simrad and B&G GoFree support included free. Drive SeaNav with live data from your Simrad, Lowrance or B&G MFD including wind and depth. For detailed information on how to use SeaNav, please consult our User Guide – the User Guide is also included in the app, so you can refer to it while you are using the app on your iPhone or iPad. 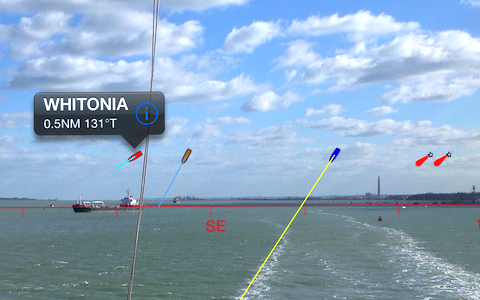 There is also a demo simulation mode in the app so you can try out all the sailing features back at home. See the demo user guide for more information. Our extensive FAQ can also offer you help and advice on getting the best out of SeaNav. SeaNav runs on iPhone or iPad, with iOS6.0 or above. GPS only required for real time route navigation. Tides, Weather and live AIS Ship positions require an active internet connection.